I Love Going to a New Grocery Store! | Keep It Up, David! I still get a kick out of grocery shopping, because it involves all sorts of fun things: I get to plan what I’m going to be eating, check out new products, try new things, flip through tabloids in the checkout line. I recently got a flyer in the mail about a new grocery store opening nearby, and it was literally the most exciting thing I got in the mail all week. I figured out right away that Grocery Outlet can offer low low prices because it’s one of those close-out stores, kinda like Big Lots, that’s filled with discontinued items or surplus merchandise that’s discounted because it’s not selling elsewhere. 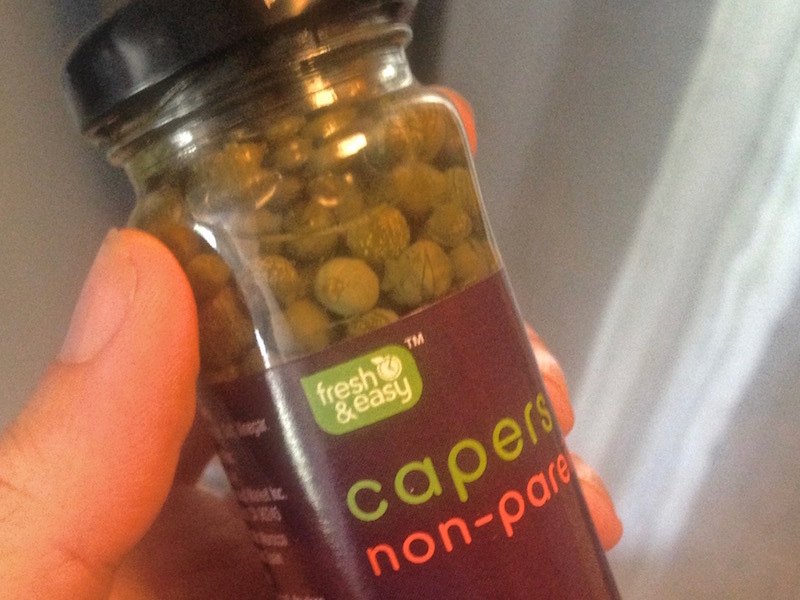 I could tell because there were seasonal items that weren’t in season (like Christmas-themed Pop Tarts), and these capers I bought, which are the store brand from another grocery chain that recently went bankrupt. I’m not complaining. I like a good deal just as much as the next guy, and as long as the food isn’t expired or something, I’m fine with buying it. I found plenty of stuff to buy. I stocked up on frozen veggies, canned beans, and they had great prices on eggs. 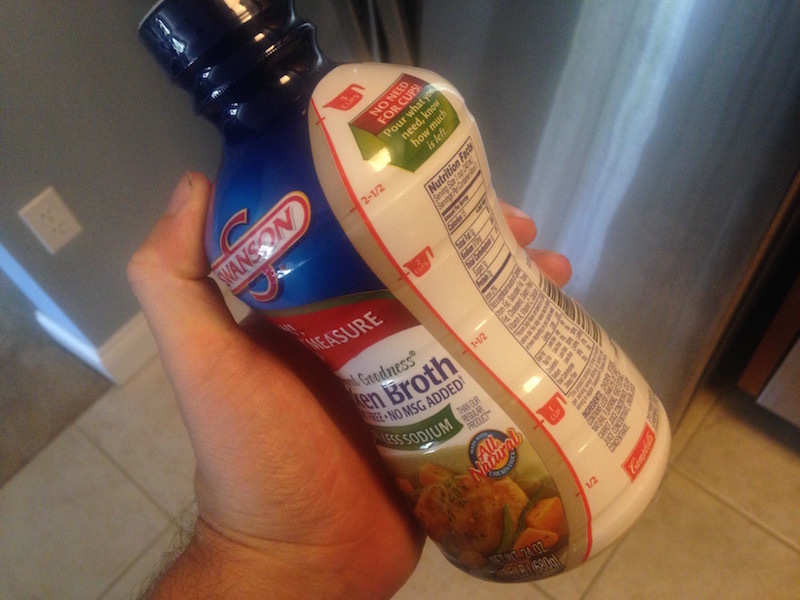 This Swanson’s bottle of reduced sodium chicken broth had a graphic on the side, to let you know how much was left in the bottle, and that’s a great idea that solves a problem I have every time I buy a big container of broth, so I bought it. 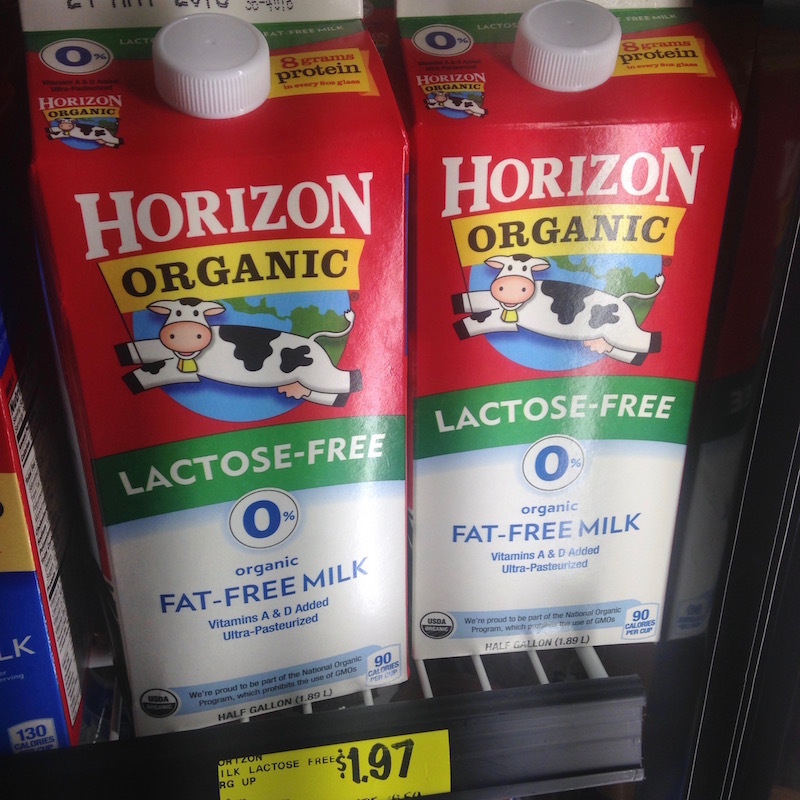 And I’ve never seen Horizon Organic milk for so cheap – roughly $3 less than I normally see it. I’ve never had lactose-free milk before, but now seems like a perfect time to try it! 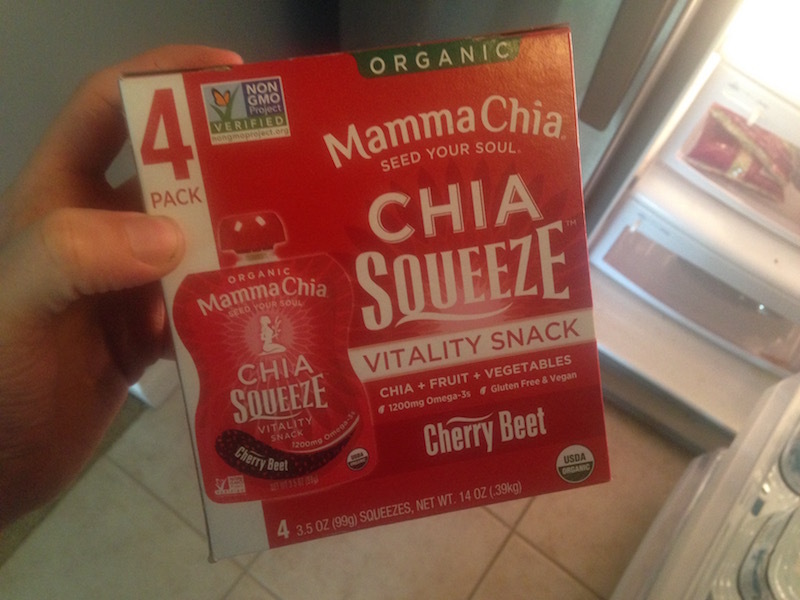 They had lots of stuff I probably wouldn’t buy if it was full price, but I would gladly try because it’s deeply reduced, like these chia pouches, which are high in omega-3s and combine chia seeds, fruit, and vegetables. The problem with close-out stores is that there’s no guarantee that they’ll have what you’re looking for. Inventory changes depending on what items are available that they can purchase, so if you like an item and go back for it one week later, it may not be on the shelf. I might swing by Grocery Outlet again if I’m flexible in what I’d like to purchase, but if I have a specific list of stuff that I need for a recipe, for example, I’m definitely heading someplace else. 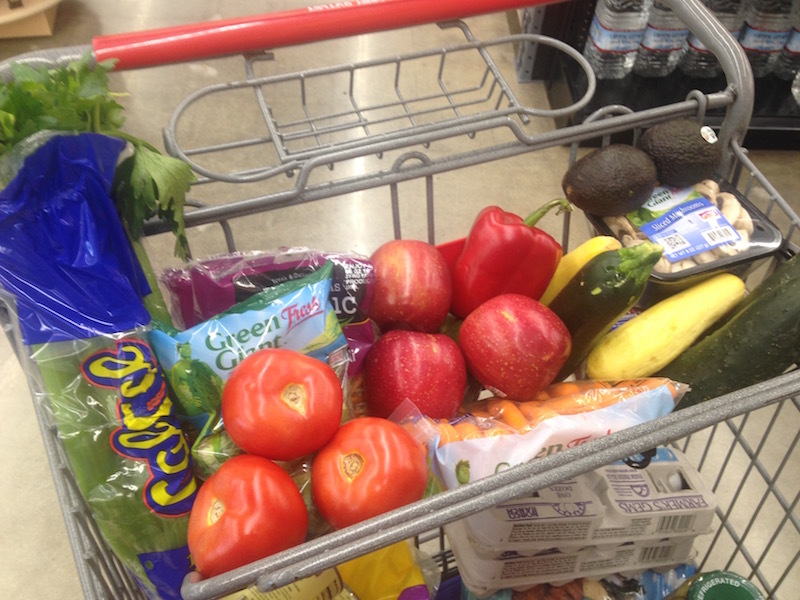 The nice thing about Grocery Outlet is that they have a nice produce section, which many close-out stores don’t have. I was able to load up on fruits and veggies. My receipt told me that I saved 50% by shopping at Grocery Outlet, although I question the accuracy. It wasn’t that items were on sale from what Grocery Outlet normally charges, it was that I saved 50% compared to what other stores would charge, or maybe 50% compared to the manufacturer’s MSRP. It’s not clear, and I don’t assume that Grocery Outlet is an authority on what I would spend elsewhere. 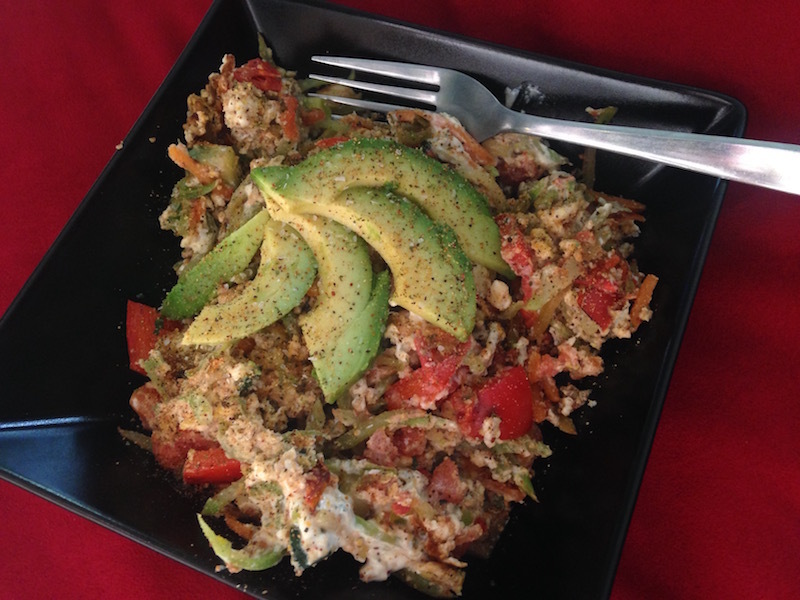 The produce was delicious, though – the first thing I made with it was this veggie and egg scramble: sauteed broccoli slaw, tomatoes, red pepper and zucchini, with 2 whole eggs and 2 egg whites, topped with avocado. I’m curious about other opinions about Grocery Outlet. Share your thoughts in the comments section, as well as any tips or tricks for shopping at a close-out store! This entry was posted on Thursday, May 26th, 2016 at 12:33 am and is filed under Uncategorized. You can follow any responses to this entry through the RSS 2.0 feed. You can leave a response, or trackback from your own site. 7 Responses to I Love Going to a New Grocery Store! No picture of the delicious organic milk you bought? I just added it. I forgot I had that picture! That’s what happens when I write a blog post at midnight. Thanks, David! I haven’t seen any of those stores in my neck of the SoCal woods yet. This week I bought 100 1-pound cans of wild Alaska keta salmon each for … 99-Cents Only. Actually I bought one can last weekend as a test, & it was delicious. They have June 1, 2018 expiration dates, so that’s about 1 per week. After draining the water, they contain about 10 oz. of salmony yum-yum, so that’s roughly $1.60/pound. I’ve never seen any other fresh/frozen/dried/canned/whatever salmon anywhere near that price, have you? That’s so funny – I’ve seen that keta salmon at the 99 cents only store and had never heard of keta before, so I wanted to research before buying, so thanks for the review! Keta also goes by the name of Chum in the salmon family. 99CO also sells 8oz cans of “Pink”, alternately named Humpie/Humpy. I didn’t see or taste any difference between the 2, so that’s why I stocked up on the Keta instead. These cans are distributed by Ocean Beauty (“the leading U.S.A. packer”), & here’s a link to their canned page. If you get a can, take a bite & don’t like it, I’m sure Maude will be happy to finish it for you! Update: This week Redondo officials announced that Grocery Outlet would be opening its first South Bay store later this year, only a mile from my house! Woo-hoo! WOOHOO! Let me know how you like it.